BOSTON, MA -- We've reached the final 4 weeks of the calendar year, and the past 11 months have been excellent across the Eastern Hockey League Premier (EHLP). Focusing in on November in particular, the EHLP saw plenty of great performances from all of the teams and players throughout the league. 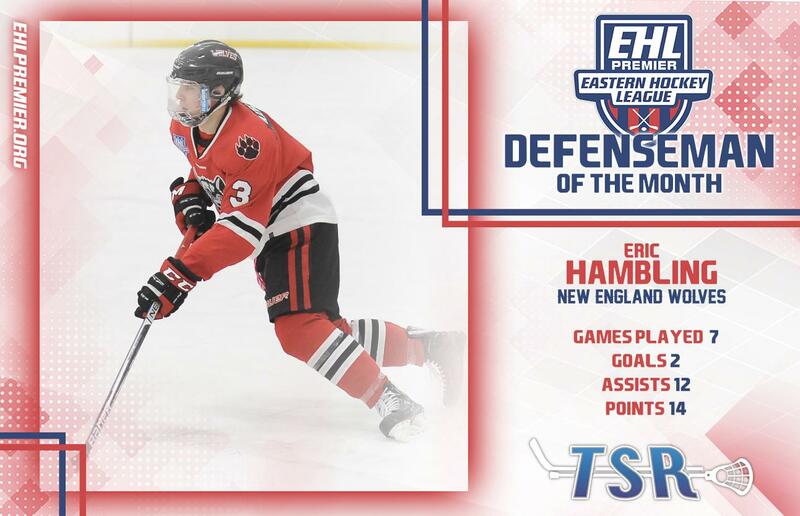 With all the top-notch performances, the EHLP was presented with many worthy candidates for our third set of TSR Hockey Stars of the Month. 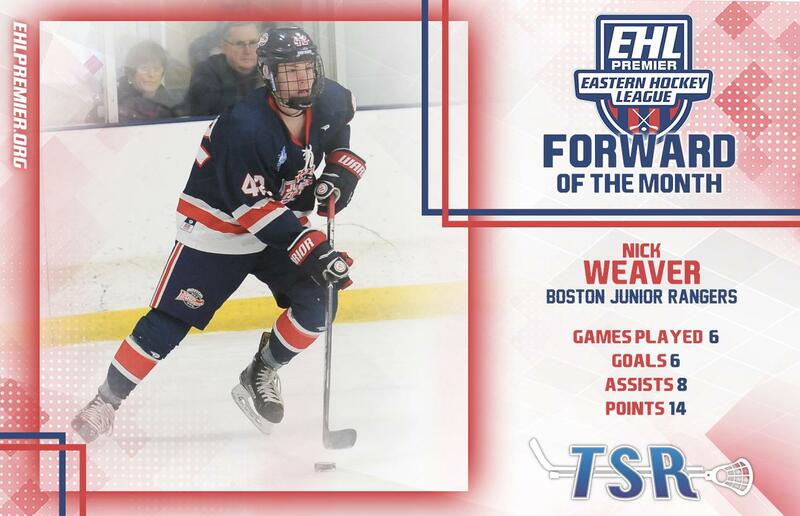 The EHLP is pleased to announce that Nick Weaver (Boston Jr. Rangers), Eric Hambling (New England Wolves), and Graham Burke (Philadelphia Little Flyers) have been named the TSR Hockey Stars of the Month for November. Scroll down to read about each player's set of November performances, and remember to catch the #Eshow action all year long on HockeyTV. Weaver and the Rangers posted a record of 7-0-1 in 8 games during the month of November, as they moved past the New England Wolves and into the top spot in the New England Conference. The '99 forward from Rio Rancho, NM was a key factor behind his team's near-perfect month, tallying 6 goals and 7 assists to his name. For the season Weaver now has notched 29 total points, which ranks him as the 3rd leading scorer on the Rangers. After beating the Connecticut Chiefs this past Saturday night, Weaver and the Rangers saw their December record fall to 1-1-0 when they lost to the Wolves yesterday afternoon. Looking ahead however, the Rangers will try to build back some momentum with 3 more games left before the holiday break. Hambling and the Wolves posted a similar mark to the Rangers, going 7-1-0 in their 8 games during November. The 2002-born defenseman has played a big role to his team's success this season, and that includes a pair of goals and 12 assists this past month. For the year, the young defenseman now has 27 points through 23 games, and he's added his name to the box score at least once in 7 of his last 8 contests. While the Boston Jr. Rangers have moved slightly ahead of the Wolves in the standings, New England did begin to cut into the deficit with an 8-4 victory over their rival on Sunday. Looking ahead, Hambling and the Wolves have 4 games left before the holiday break, as they look to make things even tighter. Last, but not least, we wrap-up the award recipients in the EHLP, the same way we did in the EHL. 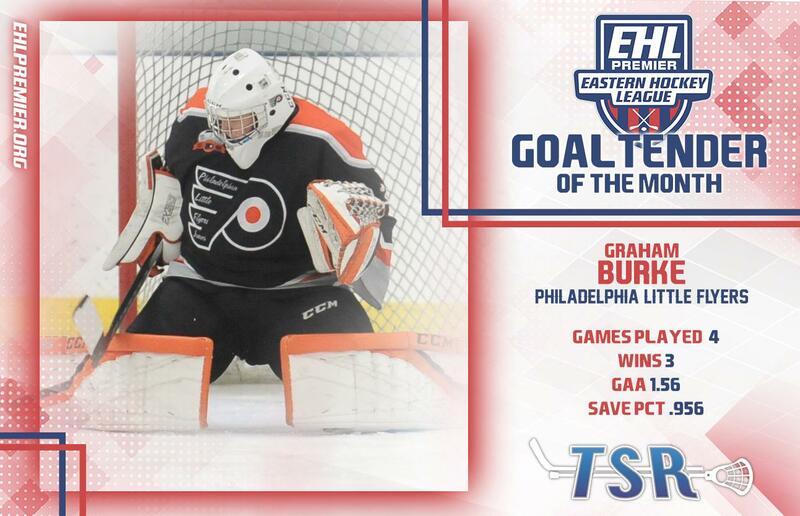 This past month's top netminder comes from the Little Flyers, as Burke picked up 3 more wins to his name. Overall the 2001-born goaltender from Baton Rouge, LA posted a record of 3-1-0 to go along with a 1.56 GAA and .956 save percentage. For the season, Burke is now 11-2-1, and his 3 shutouts are the top mark in the EHLP. The Little Flyers anchor is a big reason why his team is at the top of the Mid-Atlantic Conference standings with 23 games left in the 2018-19 regular season. Burke and the Little Flyers have 5 games remaining in December, 4 of which will take place in the friendly confines of the IceWorks Skating Complex.